Let’s aim for something a bit lighter today. Well, lighter in all things but calories, perhaps. 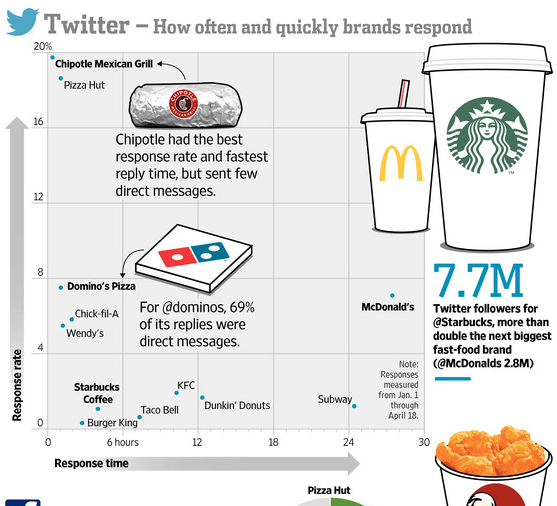 Today we have a piece from the Wall Street Journal that looks at the social media presence of several large fast food brands. Overall, it has a few too many gimmicky illustrations for my comfort. But, the strength of the piece is that it does look at some real data, e.g. plotted Twitter response rates, and then contextualises it with appropriate callouts. Who cares about your tweets? The illustrations are killing me, though. Credit for the piece goes to Marcelo Prince and Carlos A. Tovar.